This recipe is absolutely divine and the only thing i like to use on my face. It must be said that this is NOT the real deal expensive rosehip seed oil where they press the tiny seeds to produce the oil. In my experience of using this oil over the last few years i can vouch for it’s efficacy, nourishment and vitality. First extract the seeds from the fruit. Wear gloves if you have sensitive skin as those tiny hairs can be an irritant. Leave these seeds laid flat on baking tray over night to dry out, this will avoid a sticky mess in the grinder. Keep the outside fruit flesh to one side, maybe wash and nibble on a few as absolutely delicious. Some of the flesh could also be dried in a dehydrator to be used in tea blends or to eat. Finely ground rosehip seedsWhen grinding the seeds i use a coffee grinder. A succession of short bursts to lessen the strain on the grinder as the seeds are very hard. Place ground seeds and the majority of the fruit flesh in a pan and cover with an organic oil of your choice at least 2inches above the plant matter. I used sunflower but olive, macadamia or hemp are all good options. Stir well. Turn onto lowest heat and stir continuously without letting it bubble or boil for about 10 minutes. You should be able to smell the sweetness of the fruit once it is ready. Take off the heat and strain through a jelly bag so those fine hairs are all taken out. Make sure all appliances used have been sterilised. Let it cool down and then mix in 1% of Frankincense essential oil. Frankincense is predominantly relaxing yet rejuvenating in it’s properties. Rosehip oil is full of Vitamin C & Vitamin A and has an antioxidant, anti-aging effect on our skin. The Primrose possesses somewhat similar medicinal properties to those of the Cowslip which is used more often in clinic situations these days. Be wary to cultivate them yourself at home too close to each other as they cross pollinate, also it is advised against picking wild cowslips due to sustainability issues. The aerial parts are most commonly used when fresh and in bloom and sometimes the root. In the early days of medicine, the Primrose was considered an important remedy in muscular rheumatism, paralysis and gout. Pliny speaks of it as almost a panacea for these complaints. The whole plant is sedative and too much has been said to cause delirium so use in moderation. I find that it can be a good gentle sedative for children when taken as a tea, flower essence or drops of tincture. An infusion of the roots is a good remedy against nervous headaches. The roots are harvested in the autumn when two or three years old and dried for later use. An ointment has been made from the plant and used for treating skin wounds. It is used mostly today as an expectorant (due to saponins) and tonic to the respiratory & nervous system. It also contains salicylates which are the main ingredient of aspirin and have anodyne, anti-inflammatory and febrifuge effects. This remedy should not be prescribed for pregnant women, patients who are sensitive to aspirin, or those taking anti-coagulant drugs such as warfarin. I thought i’d re-post my first ever blog, which was a guest blog for my dear young (11yrs) friend Gracie Chick. Her blog; A light in the darkness is very inspirational. This is very exciting, at the ripe old age of 33 years I am writing my first blog. A big thankyou to my dear friend Gracie for inspiring me and letting me write a guest blog here. Gracie and I share a love of plants and we have spent many days together foraging, learning about plant identification and their many medicinal properties. This is really where my heart lies. I am just about to qualify as a herbalist too, which only really means I know a small amount about the plant kingdom as all it’s secrets are never ending! 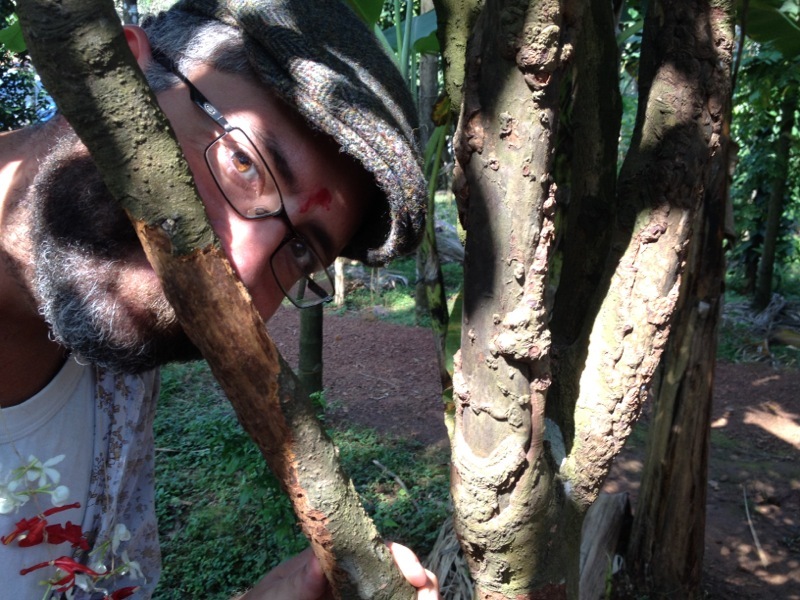 Today I would like to share with you a little of what we learnt on our visit to Sahakari spice farm in Goa, India. Some of the most expensive spices to buy are Saffron, Vanilla, Cardamom, Clove, Cinnamon, Pepper and Turmeric. Have you ever wondered why? Saffron is THE most expensive spice in the world. It comes from the stigma of the blue flowering crocus (Crocus Sativus). 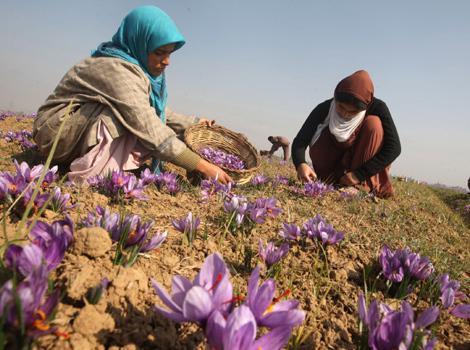 The stigma must be hand-picked and it takes a lot of stigmas (200-500) to make 1 gram of saffron. Vanilla is the second most expensive spice in the world and comes from the beans of vanilla orchids. The flowers may only be naturally pollinated by a specifically equipped bee found in Mexico. Growers have tried to bring this bee into other growing locales without success, so the flowers are now artificially pollinated by hand and the fruits are picked by hand once ripe. The vanilla flower only lasts about one day, sometimes less! 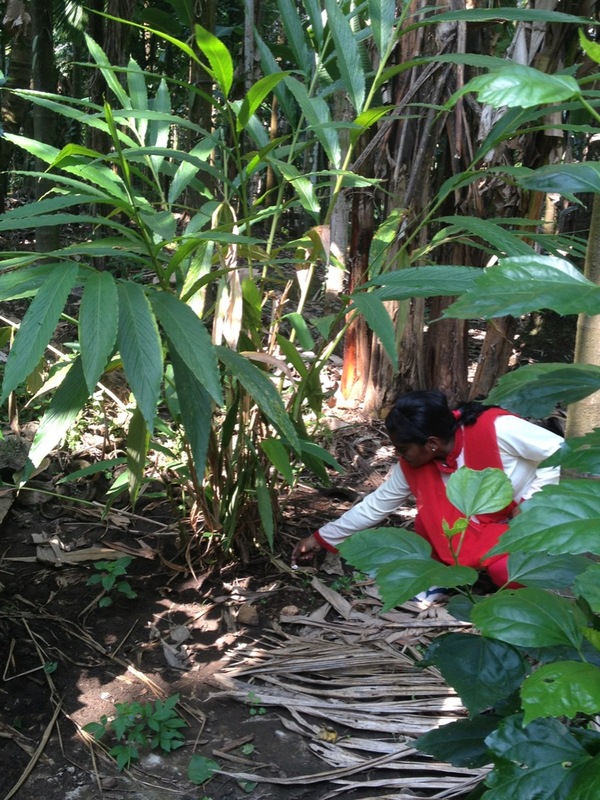 Therefore, farmers have to inspect their plantations every day for open flowers on the vanilla plants, a labour-intensive task. It takes up to three years after the vines are planted before the first flowers appear. The fruits, which resemble big green beans, must remain on the vine for nine months in order to completely develop their signature aroma. However, when the beans are harvested, they have neither flavour nor fragrance. They develop these distinctive properties during the curing process. Cardamom (Elettaria Cardamomum), the Queen of Spices, is a perennial herb and member of the ginger family, Zingiberaceae. Like ginger, cardamom has a fleshy rhizome and long, lance-shaped leaves. 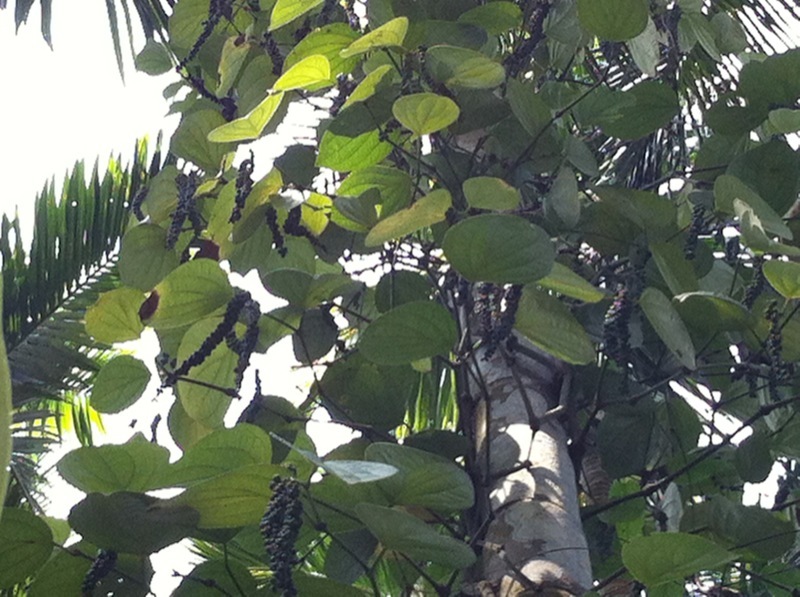 In Goa, cardamom plants flower continuously from the last week of April or first week of May until the second week of October. Each cardamom flower lasts a single day. Insect pollinators are required for fruit production. A single flower receives as many as 130 visits from pollinators on a sunny day to just over 20 visits on a rainy day. If pollinated, each cardamom flower produces a single capsule containing about 10 seeds and about 10 pods produce 1 teaspoon of powdered cardamom. Cardamom has long been used for calming digestive complaints and has strong anti-oxidant properties. It is also high in iron, manganese, potassium, calcium and magnesium. I like to add it to my occasional cup of coffee as it takes away the unwanted side effects and keeps me grounded in the caffeine buzz. Cinnamon (Cinnamomum Zeylanicum is the true cinnamon, you will often see ‘Cassia cinnamon’ for sale so read the labels) is obtained by stripping the outer bark of the tree and removing the inner bark in rolls. The bark is then dried and sealed in airtight containers. Cinnamon trees are small evergreen plants that can reach 32 to 49 feet in height. Cultivated cinnamon trees are grown in the form of a bush. A cinnamon tree can live from 30 to 40 years in the wild but when cultivated they are killed during the harvesting process. Did you know cinnamon helps balance blood sugar levels? It can also be used to help digestion and reduce muscle spasms, colds, diarrhoea and vomiting, and has anti-fungal properties. Pepper (Piper Nigrum) is known as the King of Spices. It is the most traded and most used spice in the world. Black pepper is a flowering vine in the family Piperaceae. Peppercorns are harvested while half-matured and just about to turn red. They are then left to dry under the sun light until they become shrivel and turn black (black peppercorns). Alternatively, green peppercorns are picked while the berries are still unripe and green. The white peppercorn got its name when a completely ripe berry is soaked in brine in order to remove its dark outer skin, exposing the inner white-colour pepper seed. Adding pepper to your food helps you absorb other nutrients from your meal, has anti-inflammatory properties, helps digestion and is full of vitamins and minerals. So move aside the salt shaker and bring on the pepper! A pepper vine growing high up a tree. Can you see the strings of pepper berries dangling down? Turmeric (Curcuma Longa) is a perennial herb which grows to 1m tall with underground rhizomes. It produces tall, very beautiful, white flower spikes. Turmeric is now being successfully grown in the UK in polytunnels and greenhouses. Why not try and grow it yourself? Buy some fresh root from your local Asian store, leave in a paper bag in the dark until it sprouts and then plant in a large pot in your greenhouse. Rhizomes are harvested 9 to 10 months after planting, when the lower leaves are turning yellow or when stems dry and fall over. It is possible for the home gardener to just dig carefully at the side of a clump and remove rhizomes as needed rather than harvesting the whole clump. It is important to buy organic turmeric as often the active constituent (called Curcumin) is extracted, sold in tablets, and then the left over powder sold for culinary purposes. Curcumin has powerful anti-inflammatory effects and is a strong anti-oxidant too. Curcumin is poorly absorbed into the bloodstream though and needs a little helping hand from pepper which will improve it’s absorption rate by 2000%. Turmeric would be very useful in prevention and treatment of arthritis, Alzheimer’s, depression and age related diseases. Herbalists use spices a lot in daily life with the principle that “food is medicine, and medicine is food”. I think it is really important to understand where the herbs and spices come from and to appreciate every process that took place to bring it to you and for you to use them wisely and in a sustainable way. For example, you can re-use your vanilla pods time and time again and this recipe for an immune boosting winter tonic tea can be re-used up to 3 times by just adding more water. Boil all the spices together for 10 mins, letting them all infuse in a strong decoction. Drink throughout the day, hot or cold. I can’t say I always stick to them, but this year I have a strong sense that i’m up for the challenge of new year aspirations. It feels good to challenge oneself and get out of a few ruts. In the depths of winter it’s not an ideal time for a detox as such as this is best saved for Spring when you want to get your lymph moving and as it happens all the spring herbs come up to help. This time of year however is perfect for reflection and re-adjustment. Here at Sacred seeds HQ we’ve been thinking about what is important to us for 2016 and what we feel most passionate about. These 10 points below will be a running theme throughout the year ahead as well as regular plant musings. Use less plastic – Being prepared ahead of time is key. It’s not just for environmental reasons but personal health reasons as well that you need to reduce plastic. I have fallen off this wagon of late, giving into convenience and time constraints. I managed a whole year off supermarkets several years ago and only shopped in local suppliers with plenty of organic options. Being on the road alot for the last year this pattern has slipped and 2016 is the year for me to regain this control over my shopping needs. It means taking time out of your week to catch the local independent shops during opening hours, to schedule in those farmers markets and also if you are able to make more time to grow your own organically. Why not sign up to a local veg box scheme? Here is a great article explaining more about core techniques involved in the Art of Mentoring and 8 Shields Mentoring and Nature Connection. 4. Gifting time to creativity. Make more Nature Mandalas…..
6. Love oneself – Nourishing mind, body and spirit. Self acceptance. A life long journey for some that deserves constant attention. 8. More Yoga. Even the NHS is promoting yoga now. Dozens of scientific trials of varying quality have been published on yoga. While there’s scope for more rigorous studies on its health benefits, most studies suggest yoga is a safe and effective way to increase physical activity, especially strength, flexibility and balance. There’s some evidence that regular yoga practice is beneficial for people with high blood pressure, heart disease, aches and pains – including lower back pain – depression and stress. Project HQ will soon be based near this area of outstanding beauty that is Beachy Head. Feeling grateful for all the future hikes this closer proximity will lead to. Bring on the green gym and nature walks for 2016! 10. Herbal Help – Sending home made herbal remedies to refugee and protest camps. I plan to make extra herbal medicine and send it to the refugees in Calais and also Herbalists against Fracking supporting anti-fracking protestors. Medicines that are also food such as infused vinegars and fire cider, plus teas, powders and tonics will be useful esp in Calais where alcoholic tinctures are not suitable for the large muslim population. If you’d like to help why not get in contact and we’ll plan a day of foraging for wild medicines to send to these locations. If any one of these aspirations resonates with you why not get in touch and we can buddy up to support each other. Follow me on Instagram for my sit spot posts or twitter and facebook for sugar free recipes. Or sign up to my newsletter for the full updates. Kicking off my first blog with a pretty big topic, one that is close to my heart and also a personal struggle as I know it is for many out there. If you’re not sure if you’re addicted to caffeine I dare you to give it up for 2 days and see how you feel. Most report cases of headaches, lethargy, disorientation, nausea as well as muscles aches, which are classic drug withdrawal symptoms. This can occur even if you only normally drink one cup of coffee a day. The higher your consumption the more severe the withdrawal. In our culture we are constantly surrounded by massive consumption of this powerful and socially acceptable drug. For me coffee comes under the herbal (medicinal) category and should therefore be used respectfully. Once considered an exotic treasure this hugely addictive substance is steeped in a dark history and blighted by the dirty secrets behind this controversial multi-billion dollar industry that most people choose to ignore. Long-term use has been linked to high cholesterol, heart disease and osteoporosis. Occasional organic (it is a pesticide intensive crop) cups of coffee may reduce risk of developing Parkinson’s, gallstones, kidney stones and liver cirrhosis in heavy drinkers. Drinking coffee on an empty stomach stimulates the production of HCL (hydrochloric acid) which your stomach needs to digest food but with nothing in your tummy this action is wasted and it may find it difficult to produce enough HCL when you have actually eaten a large meal. Instead try to substitute coffee first thing in the morning with a warm fresh lemon water to wake up your kidneys ready for the day followed by your (healthy) breakfast. If, like me, you have to have a coffee then waiting to mid-morning after all your usual detoxification processes have occurred naturally is the best approach. If you’ve got IBS (Irritable Bowel Syndrome), acid reflux, ulcers, diarrhoea, insomnia, breathing problems, adrenal fatigue/burn out, any hormonal issue, weight gain around your middle, anxiety or depression I’d strongly urge you to give it up. Drinking lots of coffee will promote the release of the stress hormones cortisol, epinephrine and norepinephrine. These chemicals increase your body’s heart rate, blood pressure and tension levels – the old ‘fight or flight’ response. We often say we need to drink coffee to give us energy. But has it gone further than just energy and turned into a kind of jittery tension that is always on and makes it difficult to relax? Maybe it pushes you to get through the paperwork, but longer-term the health implications of this kind of ongoing stress are significant. I don’t want to be the fun police here, but I would like to urge you towards an occasional cup instead of daily. Why not try some of the herbal suggestions below to balance that cup or take it caffeine-free. Watch the movie Black Gold if you dare – or drink organic Fair Trade coffee and give thanks to all the souls less fortunate than us who are part of the long chain of people who worked hard to bring this coffee before you. Drink it consciously and bring some of the sacredness back into this wonderful treat. Here are a few ways to spice up your coffee or try some recommended coffee substitutes. I’m based in East Sussex and available for face-to-face consultations in Sheffield park, Nr Uckfield or at About Balance in Brighton.